The average funeral with burial today, costs over $10,000. By knowing what to ask, what to say, and who to call at critical points of the arrangement process, however, the family can save hundreds or even thousands of dollars. It is our aim to educate the public on what is, and isn’t, required by law in regards to funerals, as well as common sales ploys, misconceptions, and downright scams that have driven funeral costs up at a rate several times normal inflation over the past decade. Much of the information contained within these pages is paraphrased from the book The Affordable Funeral: Going in Style, Not in Debt by Dr. R. E. Markin, former director of the Alzheimer’s Research Foundation and author of the popular care manual, Coping With Alzheimer’s. Dr. Markin surveyed over 3,000 funeral homes, casket manufacturers, cemetery associations, and — most importantly — over 700 former employees of the death care industry, while researching this work. 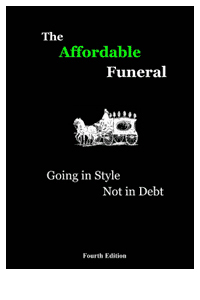 You may have seen the book in LIFE, INC, MONEY, US News & World Report, Modern Maturity, Kiplinger’s, and a range of other periodicals, and it stands today as one of the most user-friendly commonsense guides to funerals available.